Acetone is a highly effective thinner and remover for epoxy resins, ink, adhesives, and lacquers. It thins and cleans fiberglass resins. Acetone evaporates quickly, and leaves no residue. Acetone can also be used to clean up dried latex paint, uncured lacquers, and adhesives. Unit Height: 13.5 in. Unit Width: 11.38 in. Unit Depth: 11.38 in. Unit Weight: 36 lbs. Case Height: 13.5 in. Case Width: 11.38 in. Case Depth: 11.38 in. Case Weight: 36 lbs. Where can I buy Carbo-Sol? Carbo-Sol was discontinued in January, 2006 because of changes in air pollution regulations in California and other states. Sunnyside Mineral Spirits, Naphtha or other products may be used for many applications where Carbo-Sol was used. Carefully read and follow all warnings and directions on product labels. 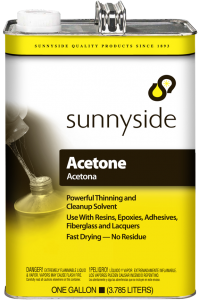 What is the purity of Sunnyside Acetone? 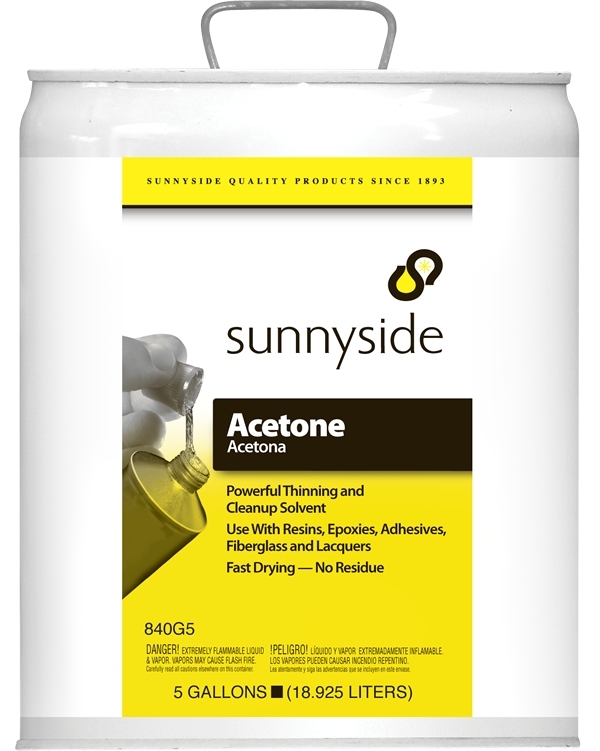 Sunnyside Acetone has a minimum purity of 99.5%, as supplied in original container. Is Sunnyside Paint Thinner 100% Mineral Spirits? Sunnyside Paint Thinner contains only Mineral Spirits. Can Sunnyside Turpentine and Boiled Linseed Oil be used as artist's supplies? 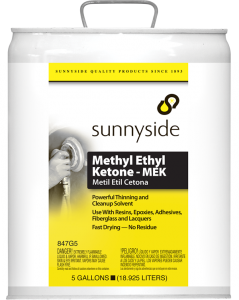 None of Sunnyside's products have been certified by the Consumer Product Safety Commission as artist's materials. Can I use Acetone or Lacquer Thinner to remove floor adhesive? No, these products are extremely flammable, and could easily result in a catastrophic flash fire if used for adhesive removal. A better choice is a non-flammable product, such as Ready Strip Mastic Remover. Carefully read and follow all label warnings and directions. What product should I use to clean bare metal surfaces prior to painting? 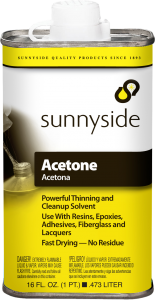 Sunnyside Acetone will leave a residue free surface in preparation for painting. Carefully read and follow all label warnings and directions. Can Sunnyside Paint Thinner be used for cleaning paint brushes used with latex paint? No, Sunnyside Paint Thinner is used only with oil based paints. Green Envy Paint Thinner can be used with water based coatings as well as most oil based coatings. What product should I use for thinning an oil-based porch and deck enamel? Sunnyside Xylol is commonly used for thinning this type of paint. Always consult and follow the paint manufacturer's directions before thinning. Can Mineral Spirits be used to remove grease or wax build-up on wood surfaces? Yes, Sunnyside Mineral Spirits will work well for this purpose. Carefully read and follow all label warnings and directions. Petroleum distillates are the fuels and solvents that are produced from the distillation of petroleum. Mineral spirits, naphtha, kerosene and gasoline are examples of petroleum distillates. What can be used to remove heel and scuff marks from laminated or sheet goods flooring? Sunnyside Mineral Spirits will work well for this purpose. Provide cross ventilation and follow all label warnings. Can Gum Turpentine be applied to cuts to heal them? No, it will further damage broken skin. Do not apply turpentine or other solvents to skin. Can oily automotive parts be soaked in Green Envy Paint Thinner? No, it contains water and would not be ideal for this application. Use Sunnyside Mineral Spirits. Is there a VOC compliant product for degreasing bicycle parts now that mineral spirits is not available in California? Sunnyside Odorless Mineral Spirits, California Compliant meets California VOC requirements for degreasers. Is Xylol the same as Xylene? Yes, xylene is the chemical name for Xylol. Can Xylol be used to remove defective acrylic sealers from concrete? Xylol will loosen many acrylic sealers, and can be used on concrete. Because it is flammable, eliminate all ignition sources. Contact sealer manufacturer for additional information. Does Sunnyside Mineral Spirits have an expiration date? No. Sunnyside Mineral Spirits does not have an expiration date if stored in its original, tightly capped container. Is Sunnyside Gum Turpentine derived from petroleum? No. It is obtained from living pine trees. 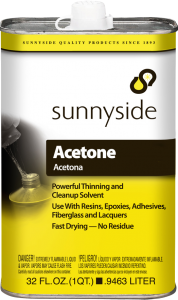 Can I use Sunnyside Acetone to clean my leather jacket? No. Acetone will extract natural oils from the leather causing it to dry and crack. Use mild leather cleaner or consult dry cleaner. Is there a low VOC replacement for MEK? Acetone is exempt (not classified as a VOC) and will work for many applications where MEK is specified. Will Sunnyside Paint Thinner remove paint from a cabinet? No. Sunnyside Paint Thinner thins liquid paint but is not a paint remover. Back To Nature Multi-Strip or Ready Strip Plus can be used to safely and effectively remove paint. Can I use Sunnyside Paint Thinner to clean paint spill on asphalt driveway? No. Paint thinner will soften asphalt.